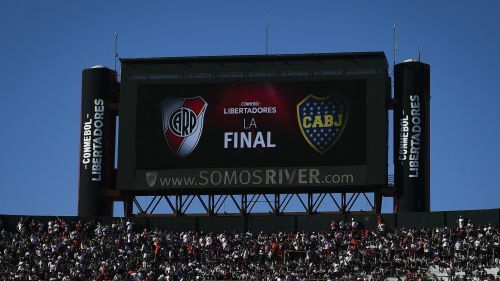 River v Boca: How did the Libertadores showpiece end up in Madrid? River Plate and Boca Juniors finally meet in the second leg of the Copa Libertadores final on Sunday, with one of football's grandest old rivalries set to be played out at the Santiago Bernabeu. Real Madrid's famous stadium is steeped in a history of huge occasions but it will feel like a surreal setting, salvaging this final to end all finals that almost ended itself. The planned fixture on November 24, following the initial 2-2 draw at La Bombonera, was thrown into chaos when River fans en route to El Monumental hurled objects at the Boca team bus. Images of players injured by broken glass and affected by police deployment of tear gas went around the world and, after kick-off was twice put back, the match was postponed. A hastily rescheduled meeting the following day was also shelved. CONMEBOL were not short of suitors after River's home ground was deemed unsuitable to host the conclusion of an enthralling spectacle turned sour. Doha, Miami, Asuncion and Genoa were all touted before Madrid won the nod. Boca Juniors are on their way to Madrid for the rearranged Copa Libertadores final second leg. That decision was protested by both Boca and River but, with each team now undergoing their final preparations in the Spanish capital, we can assume – to a reasonable degree of certainty – that the saga is about to end. But how did we get here? Allow Omnisport to recap a weekend of confusion and shame for a city besotted with football. Projectiles from the packed Avenida Monroe showered the vehicle, with some windows smashed, and Boca players arrived at the stadium seemingly affected by the use of tear gas. As Boca captain Pablo Perez and his team-mate Gonzalo Lamardo​ were checked out at hospital for potential eye injuries caused by shattered glass, CONMEBOL pressed on for the final to still go ahead. It offered a second revised time of 19:15, while a medical report authorised by the federation described injuries suffered by Boca players as "superficial". "We cannot play. They are forcing us to play the match. I understand [CONMEBOL] are under a lot of pressure," he said. "My headache is just now getting better. We have three team-mates that are in no condition to play." Boca released a statement over four hours before kick-off on Sunday, calling for CONMEBOL to suspend the match and punish River. The visitors insisted the "conditions of equality" required for the contest to take place had not been met. "After the acts of violence suffered in the vicinity of the stadium, having noted the magnitude and seriousness of them and the consequences they have generated in the establishment, Boca considers that these conditions are not met and requests the suspension of the match, as well as the application of the corresponding sanctions provided for in article 18, so that CONMEBOL acts accordingly," the statement read. Despite Boca's complaints, River announced their plans to open the gates to allow supporters to enter the stadium for the second time in two days. Bowing to Boca's wishes, CONMEBOL finally announced the game was off and would not be played this weekend. The decision was made in order to "preserve sporting equality". CONMEBOL met with both clubs at its headquarters headquarters in Asuncion, Paraguay the following week to seek a resolution. In a clumsy irony not lost on many, the Copa Libertadores was heading to Spain.